The seventh generation Volkswagen Golf will be larger, more spacious and lighter than the current model, coming in as a more fuel efficient one too. It will be based on Volkswagen’s modular transverse matrix, best known as MQB, a platform that will enable the German car manufacturer to build a variety of vehicles from one layout. The 2015 Volkswagen Golf goes on sale in 2014 and will be built at Volkswagen’s Puebla, Mexico factory. Three versions of the ’15 Golf are planned including two gasoline and one diesel engines. Volkswagen expects fuel savings of up to 15 percent over comparable sixth-generation models, quite a feat for a vehicle that gains size, yet loses weight to achieve measurable savings. 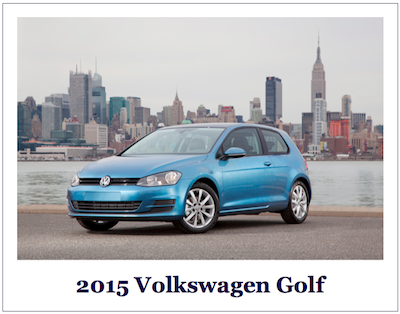 The new model is 2.2 inches longer, 0.5 inches wider and sits 1.1 inches lower than the current Golf. Weight savings will show up in many different areas including through Volkswagen’s choice of high- and ultra-high strength steels to weight savings gained inside from the seats, the climate control system and even to the subcompact hatchback’s electrical system. The standard engine is a 1.8-liter turbocharged four cylinder gasoline engine. The Golf TDI Clean Diesel will gain an all-new 2.0-liter common-rail direct injection engine. The sporty GTI will get a gasoline engine, reportedly the EA888 engine heading to Audi. Volkswagen has bet the house on its MQB architecture, an arrangement that pushes the front wheels forward to provide improved design balance. Its engines are either new or updated to reflect current innovations such as changes to exhaust headers, smaller diameter main bearings and crankshaft modifications that make use of four counterweights instead of the current eight. These particular changes are reflected in the TDI engine. Loathe to break with the current Golf’s success, Volkswagen nevertheless has made significant changes inside the 2015 Golf that can only be characterized as ergonomically smart. For instance, the wide center console has been tilted slightly toward the driver. Touch screens are equipped with a proximity sensor, enabling drivers to update functions in much the same way they do with smart phones — with a swipe of the hand. A DVD-based navigation system with 3D display is introduced with the new model. Volkswagen says that the new Golf will be feature soft touch plastics throughout the cabin along with chrome, aluminum and piano black surfaces. Other changes include moving the cruise control to the steering wheel from the column stalk and making use of white lighting on buttons and switches to set the mood. At least six airbags will be standard with the 2015 Volkswagen Golf. A new safety feature, an automatic post-collision braking system, automatically brings the hatchback to a stop in a bid to help reduce residual kinetic energy. Drivers can override the system too as desired. Additional details about the next generation Volkswagen Golf will be released next year. Volkswagen, like many other manufacturers, likes to serve up a two-year advanced model year preview of a new vehicle in the Golf. That doesn’t mean you’ll see the new vehicle this year, but it does indicate that the Volkswagen Golf will get an early jump on the 2015 model year, perhaps while competitors are scrambling to keep up. They’ll have their work cut out for them too as the upcoming model has already won its first “car of the year” award. Photo copyright Volkswagen of America, Inc.